The 78 personnel who since October have been given a grounding in seamanship, search and rescue, naval law and human rights are due to pass out in the coming days. Their education has been paid for by the EU as part of its Operation Sophia , designed to cope with and if possible stem the tide of migrants from Libya. 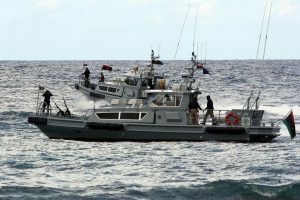 EU foreign policy head Federica Mogherini has said that a further 20 Libyan coastguards are now to be trained in Crete. It is unclear why the new group of trainees is significantly smaller in number. The continuing flow of migrants, largely from along the western coast, is set to be one of the main issues at Friday’s EU summit in Valetta. Malta, which currently holds the revolving EU presidency, is pushing for more robust action against the people-smugglers as soon as the spring and summer main crossing season begins. It wants backing for a short-term “line of protection” which would have EU naval vessels operating inside Libyan territorial waters, “closer to the ports origin”. However, anticipating strong objections from Libya, the Maltese plan envisages the Libya coastguard as being the frontline with EU vessels backing them up. From an operational point of view at least, the freshly-trained Libyan coastguard personnel would be familiar with EU naval procedures and the way in which the search and rescue part of Operation Sophia is being carried out.